BURNABY, B.C. — Federal New Democrat Leader Jagmeet Singh took aim at the Liberal government's investment in the Trans Mountain pipeline and its lack of spending on housing and Pharmacare while announcing he'll run for a seat in Parliament in Burnaby, B.C. 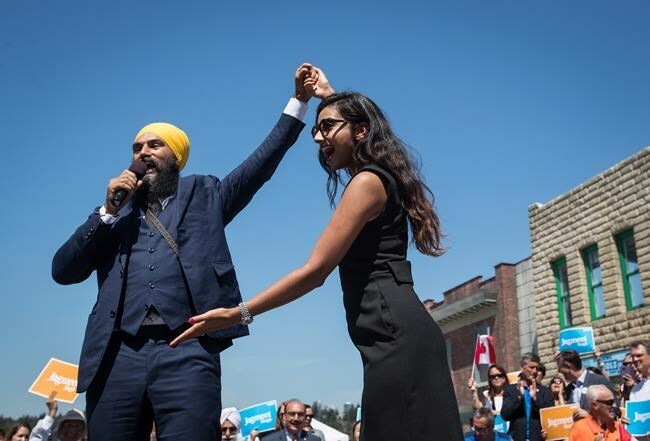 Singh announced Wednesday his candidacy for the riding of Burnaby South, which former New Democrat MP Kennedy Stewart recently gave up to run for mayor in Vancouver. Speaking in front of supporters at an outdoor film production studio in the riding, Singh said he's running because he wants the government to invest in housing and universal coverage of prescription medications. "I'm running because we don't need our government to invest public dollars, billions of public dollars, in a 65-year-old leaky pipeline. We need our government to invest in clean energies for today and tomorrow, clean energy jobs." The expanded Trans Mountain pipeline will triple the amount of diluted bitumen running through Burnaby to a terminal on the city's shore. Singh has opposed the expansion and called for a more thorough environmental review. As opposition mounted against the expansion, the Liberal government announced it would purchase the pipeline for $4.5 billion, but recent documents filed with the U.S. Security and Exchange Commision said Kinder Morgan Canada's sale of the pipeline would cost up to $1.9-billion more than the original quote. Singh doesn't live in the riding, but said a national leader will represent the issues that touch the people of Burnaby. He promised to move with his wife to the riding if elected. "Housing is a massive issue and pushing hard on these issues is what people want to see happen. We need to push the government because their plan to invest in housing two years from now doesn't make any sense when we know there is a housing crisis right now." If he wins the byelection, he will also run in the riding in the general election in 2019, Singh said. "I'm committed to Burnaby South. I'm all in on Burnaby. My wife and I talked about it and we're going to run here." He brushed off a question about the risk to his leadership if he doesn't win the byelection. "We need to have action now and we need to push this government to do the things that we need now." Singh sat in Ontario's legislature and served as the provincial NDP's deputy leader before he ran to replace Tom Mulcair as the federal leader. Running in the byelection is a risk but it's one Singh had to take, said Hamish Telford, a University of the Fraser Valley political scientist. "This is not the best scenario for him to be running in this byelection, but given the struggles he's had as leader over the past year, I don't think he had any alternative," he said. Singh needs a seat in Parliament to enhance his national exposure and the party's fundraising, so he was forced to take this gamble, Telford said. "He's a parachute candidate, it's not a reliably strong NDP seat, and it would be quite embarrassing if he runs and he loses. But of course, if he wins, then I think that's really an important lifeline for the NDP." Stewart beat a Liberal candidate in Burnaby South in 2015 by a slim margin of just over 500 votes. But the Liberal vote was likely inflated in the last election by Justin Trudeau's popularity, said Telford. The suburbs of Vancouver and Toronto are "toss-up" areas that help decide elections, he noted. "I think B.C. is going to be a battleground in the next election," he said, pointing to issues that have grabbed national attention such as housing and the pipeline. "If Jagmeet Singh is the candidate in the general election here, then Justin Trudeau is going to have to spend much more time here than he would perhaps otherwise have had to. ... It could stretch Justin Trudeau." A statement from the Liberal Party of Canada said over 10,000 B.C. residents have signed up as new Liberals in the last two years alone. The NDP countered that in 2017 alone it signed up more than 10,000 members in the province. The Liberal party statement said members in Burnaby South are looking forward to a campaign focused on Trudeau's positive plan to improve the lives of families in Burnaby. "We wish Mr. Singh well as his party's candidate in the riding, and we're looking forward to a positive campaign to contrast our ideas with the other parties."